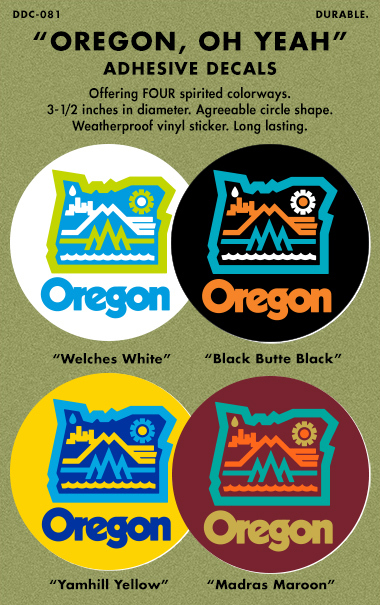 Inspired by our life in Oregon, and horked off our “Oregon, Oh Yeah” torso cover, in a adhesive decal form. You need a couple of these, Oregonians, Oregon transplants, Oregon neighbors and Oregon lovers. 02. Colors inspired by Oregon surroundings. 04. Proudly printed by the Oregon-lovers of Diesel Fuel Prints right here in St. Johns, in north of Portland. 05. Good for skateboard, shred stick, bong, Volvo station wagon window, Field Notes cover, big rig door, bicycle helmet, guitar case, tool kit and a million other places. Works just about everywhere. 06. Dedicated to “back in the day” buddies Derek, Bry, Chad, Johnny, Campbell, Robby, Yamada, Fink, Lilly, Porterfield, Robbie, Noah, Chris Laws, Bailer, Suddy and maybe even Jay Floyd .